Alright, part three of my voting for the MLS’s seasonal awards, this time around it is the Rookie of the Year award. In all honesty this is probably one of the easiest awards to vote on this season. There have only been a few rookies that have been standouts while most rookies either saw limited action (meaning they are long-term projects for clubs) or they are bordering on becoming a bust. 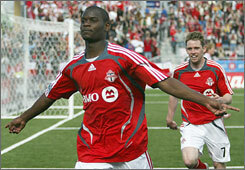 Maurice Edu, Toronto FC – clear favorite to win the award and for good reason to why I am voting for him as well. Edu has been the most consistent player on a club that hasn’t exactly seen consistency this season. When he is gone with the National team or out on injury you can clearly tell a difference in the Reds midfield and defense. Again, this selection is a no brainier. Robbie Findley, Real Salt Lake – some may shake their heads at me for putting Findley second to Edu but here is why, before Findley arrived in Salt Lake, Real was terrible on offense and since then Findley has helped lead Real to a some-what respectable record this season (respectable in regards to where they were earlier in the season to now). Dane Richards, New York – you may see a few first place votes for this kid and with good reason I would assume (sadly those first place votes will be homer votes from Ives and other New York media). But Richardson is a good pick for this award for some because of what he brings to the table: speed. Adam Cristman, New England – Who filled in for Taylor Twellman in those summer months and kept the Revs near the top in the east? This guy, and possibly he is the biggest steal of the draft, coming from the 4th round. Others that could see votes: Michael Harrington, KC; Ty Harden, LA Galaxy; Bakary Soumare, Chicago Fire. Speed + Creativity + Flare (produces) EXCITEMENT = &quot;RICHARDS&quot; He's the best!!!! Speed + Creativity + Flare (produces) EXCITEMENT = "RICHARDS" He's the best!!! !